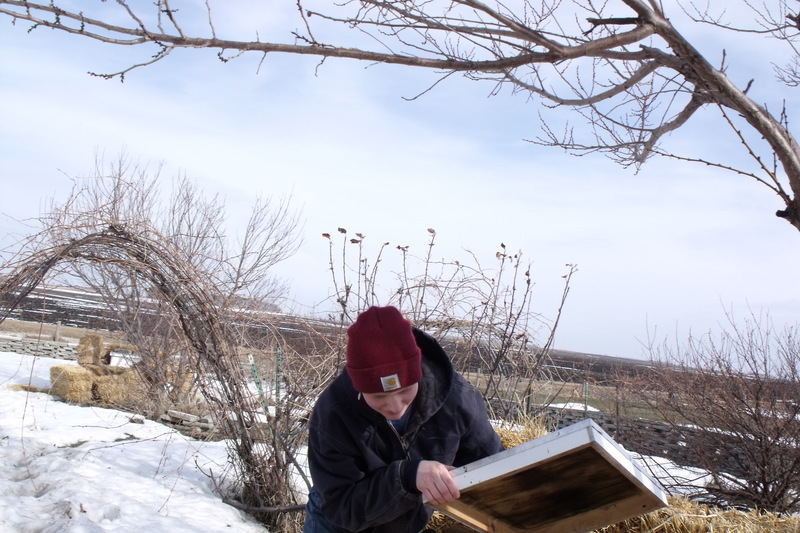 Yesterday we headed out to the garden/orchard to check on the bees. There were only a couple of bees spotted out side of the boxes and we could see guard bees at the hive entrances. They were pretty calm when Marisa opened the boxes to take a quick peak. Unfortunately, we are expecting another cold front at the end of the week but hope that if they can make it through that cold, they just might live! Marisa was checking on the pollen patty she had fed to them recently and it looked as if they had been consuming it. The patty was fed to boost their immune systems and basically build up their over all health a bit. This is one big learning experience and that is what makes it so interesting. There were some dead bees around but not so many that we were discouraged. Some death loss is expected, but we hope to avoid a total die off. So for now we just keep waiting for warmer spring days, as we look forward to the arrival of our new bees in April. This entry was posted in BEE NEWS AND UPDATES and tagged checking hives, feeding bee pollen patty. Bookmark the permalink. 2 Responses to Marisa Checking Our Bees! Great job, Marisa, and all the rest of the Callens Crew!